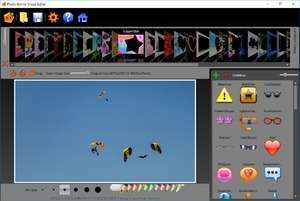 Photo-Bonny is an image and graphics editor and retoucher which can add whacky frames to your digital photographs. Offered here are various different holiday themes such as those for Christmas, New Years, Valentine's Day and others. Objects are places on top of images. The size of the image can easily be adapted to fit within defined parameters by using the crop tool. Version 2.12 is a freeware program which does not have restrictions and it's free so it doesn't cost anything. For security reasons, you should also check out the Photo-Bonny download at LO4D.com which includes virus and malware tests. Additional screenshots of this application download may be available, too. 3.2 out of 5 based on 8 ratings.